Each finisher will take home some of Bentonville’s culinary scene; a custom designed mason jar engraved with their distance containing pimento cheese topped with bacon jam, prepared by Matthew McClure, executive chef of The Hive. The Oz Trails Off-Road allows participants to choose from the Ozark 25, Ozark 35 and Ozark 50 graduated route options. While "Ozark" pays homage to the Oz Trails network, each number represent the distances of each route in miles (+/-). 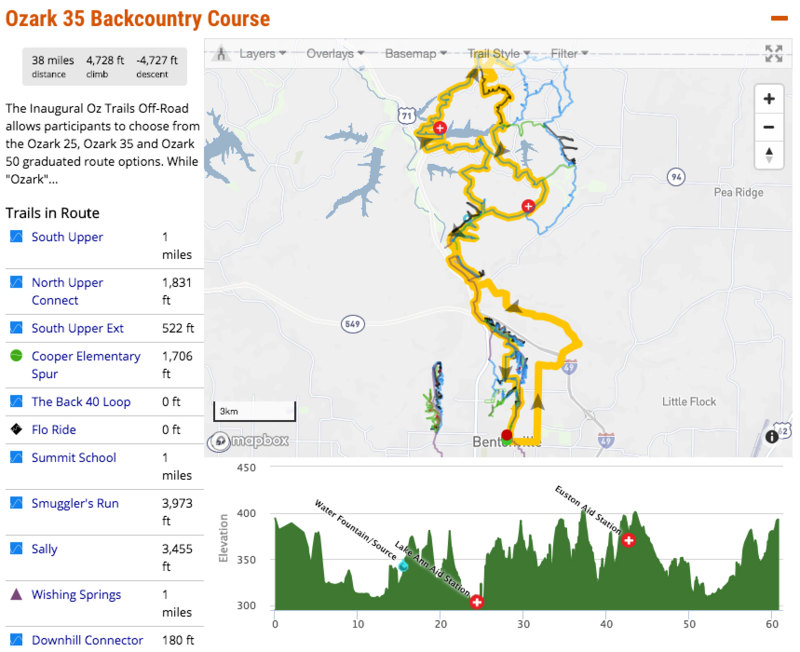 All three routes will challenge riders with varied rolling terrain connecting world-class purpose-built singletrack for mountain biking in the beautiful and rugged Ozark Mountains of Northwest Arkansas. Boasting more than 200 miles of trails connecting communities, Northwest Arkansas has become one of the hottest new mountain bike destinations in America thanks to more than $30 million invested into trails development over the last five years alone. The Oz Trails Off-Road will celebrate this community investment by taking participants on numerous feature trails, including the Slaughter Pen trail system, the Back 40 trail system in Bella Vista, AR and more. The Ozark 25 is the beginner-level “fun ride”, featuring a total of 3,100 feet of elevation gain. 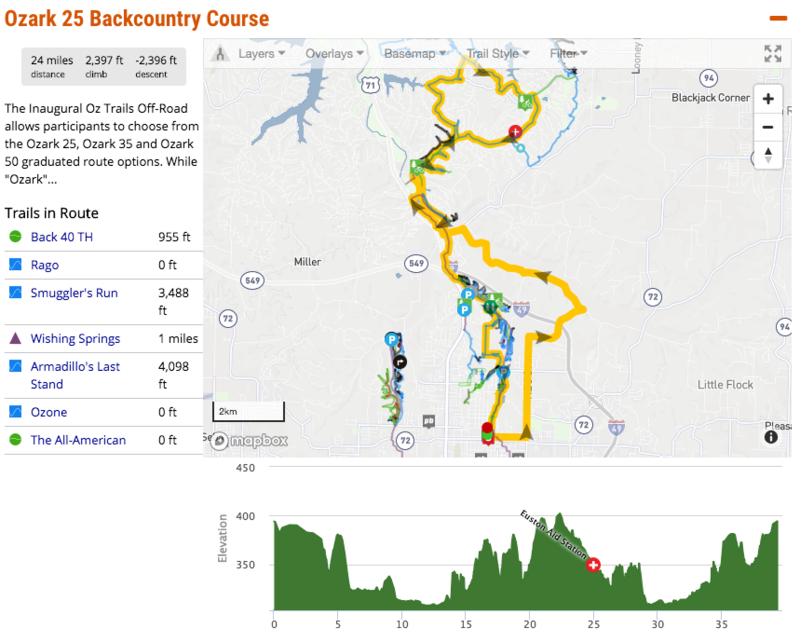 After rolling out of downtown Bentonville for the first seven miles on mixed terrain (pave` & dirt), the course hits singletrack, meandering around Lake Bella Vista and into Blowing Springs Park, connecting to the Back 40 Loop via South Upper Trail. Riders will then experience Rago trail before returning to Lake Bella Vista and hitting Smuggler's Run. The Ozark 25 then enters the Slaughter Pen trail network on Armadillo's Last Stand, transitioning to a roller coaster ride on Ozone towards Crystal Bridges Museum, finishing with All American trail. The Ozark 35 challenges riders with 4,475 feet of climbing through a succession of short, punchy climbs that gradually tax the legs and lungs. With the same mass start rollout to the Ozark 25, once into the Back 40 area, Ozark 35 riders will experience more of the Back 40 Loop. Riders will then get to experience Flo Ride, an icon of the region delivering technical downhill flow with numerous features including berms, jumps, small rock gardens and limestone ledges that will spice up the ride. From there it's onto Rago and into Slaughter Pen just like the Ozark 25, but taking Tatamagouche trail, rich with wooden features and rock armoring, working over arms as well as suspension before finishing the same way as the Ozark 25 via the legendary A-line bike to school route included in the Ozone trail. 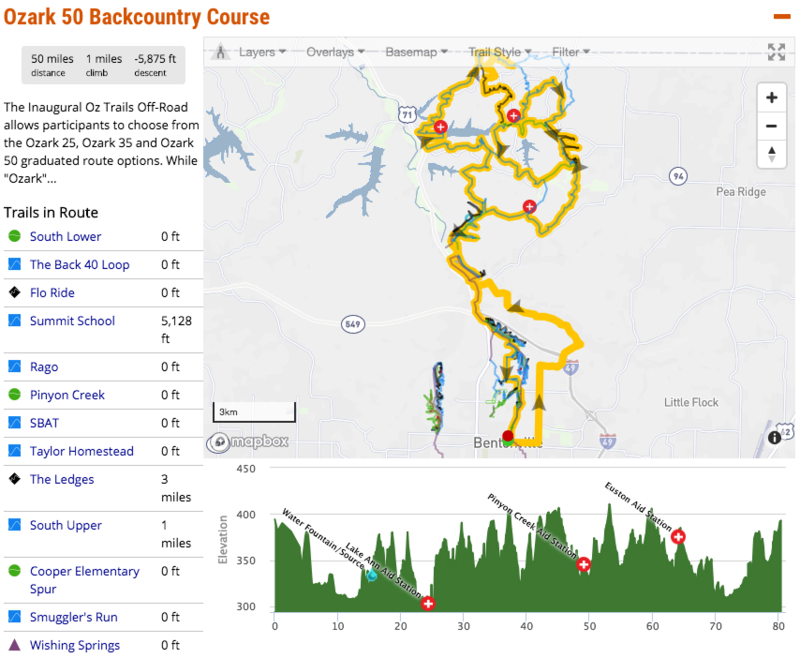 Not for the weak, the Ozark 50 is a big day on the bike and will also be the route for the Professional Men and Women on Sunday. Packing in a whopping 6,245 feet of climbing in 50 miles.. Following the same route as the Ozark 35, after completing Flo Ride, the route goes on to SBAT and Taylor Homestead trails before arriving at The Ledges, a technical, black diamond trail infamous for narrow, rocky singletrack along a ledge high above a creek bed, requiring laser focus and skill to negotiate. The Ozark 50 then hits Back 40 Loop and follows the same route home as the Ozark 35. Pinyon Creek Parking Lot: access off Castleford Dr.
2:00pm : Start Ozark 25 Fun Ride: Main St.
7:30am : Start Ozark 50: Main St.
8:30am : Start Ozark 35: Main St. The Oz Trails Off-Road event weekend has been designed so that all participants can arrive in town on Friday, park their car, and put away the keys until they are ready to depart Sunday afternoon. Words don’t do justice to the amount of support a cheering fan can provide simply through being trailside and clapping or offering encouragement for a rider. 1. Blowing Springs Trail Head. Easy to get to off of Blowing Spring Road with plenty of parking. 2. Under the bluffs on the south end of Lake Ann. A bit of a hike but a super rad spot for photo and cheering on the riders. 3. Trail Course Split off of Commonwealth Road. Easy parking and a quick hike to the trail. 4. North end of the Ledges. An easily accessible spot great for grabbing some chairs and watching the riders roll in. Epic Rides will identify key areas on the course that provide fun viewing for spectators as well as helpful presence for the riders when they need it most. This information will be shared through the Oz Trails Off-Road Facebook page. Volunteers are the backbone of Epic Rides events - your spirit and time spent is undeniably valuable. Immerse yourself in several facets of event production by signing up for a variety of available positions, such as Goodie Bag Stuffing, Course Marshal, Operations Setup/Teardown, Packet Pickup, or Timing & Results Support. Click the SIGN UP TO VOLUNTEER link below to see full list of available positions. All Volunteers should be prepared to spend quality time in the outdoors. Please remember to bring proper clothing, food & water, sunscreen, and an open mind. Everyone tends to agree participating in an Epic Rides event at any level provides memories that last a lifetime! Please sign up to volunteer on the events website. All DNF (Did Not Finish) riders are expected to email [email protected] –or report to the Timing Booth– to inform us that they are no longer on the course. Riders cut off by the race director will be considered a DNF, along with DNFs due to medical issues and mechanical failures. DNF riders may receive 50% off registration for the following year’s Oz Trails Off-Road, as a start line redemption opportunity. How was Oz Trails Off-Road?